After high school graduation, Dan enlisted in the U.S. Navy and served from 1960 to 1964, stationed in Okinawa, Japan. While serving his country Dan’s field of study was in telecommunications. After leaving the Navy, Dan settled in Portland and pursued his career in telecommunications for 35 years. While working at Pacific Northwest Bell, AT&T, and Cellular One, Dan worked his way up to manager of operations and retired in 2002. Dan’s positive demeanor and engaging personality were a delight to his friends, and he was a treasure to everyone who knew him. His affable manner and social skills enabled him to quickly make friends of strangers. To Dan, your friendship greatly mattered and he strongly secured and nurtured his friendships throughout his life. Dan met Marcy Kuhlman in Portland, and in 1990 they began a 28-year marriage. Dan possessed an almost childlike enthusiasm for exploration and adventure. While wanting to serve his community, Dan pursued with vigor the life of a volunteer fireman for the Beavercreek Fire Department and became a lieutenant. In 1977 Dan won the proud distinction of being named the firefighter of the year. Dan once mentioned there was no greater thrill than being behind the wheel and driving the big fire engine. His adventures continued when he became a motorman and learned to drive the trolley car that traveled from Lake Oswego to downtown Portland. In 2003 Dan and Marcy moved to their newly constructed home in Camp Sherman where they commenced to involve themselves in all kinds of opportunities. They shared a love for traveling in their RV for 10 years and often enjoyed visiting their small beach getaway in Florence. Friends were well aware that Dan could meet any challenge in parking that large RV in any size of campground. Dan and Marcy also made many trips abroad and considered Africa and Spain among their favorite countries. Dan took much pleasure in reading all kinds of literature and helped to create “The Men’s Book Group” which existed for 13 years. Dan served as the esteemed secretary of the group for several years. Dan zealously involved himself in several outdoor activities which included hiking, snowshoeing, and fly-fishing. Living close to the Metolius River, Dan was motivated to learn the skills of fly-fishing and gradually became adept in this sport. However, his fishing comrades knew that whenever Dan waded into the waters of the Metolius, the wily and elusive trout of the river usually took little notice of him. With his usual sense of humor, Dan advocated that catching wasn’t important and it was his good fortune to share in the beauty of the Metolius. In 2011, after eight memorable years in Camp Sherman, Dan and Marcy moved to Sisters where they could more conveniently participate in more activities in their new town. A new addition arrived in their home about two years later when a delightful young doggie named Bentley became their constant companion. In his desire to contribute to the community, Dan actively involved himself with volunteer projects through his connection with the local Kiwanis Club. Dan passed away after a valiant 14-year battle with prostate cancer. 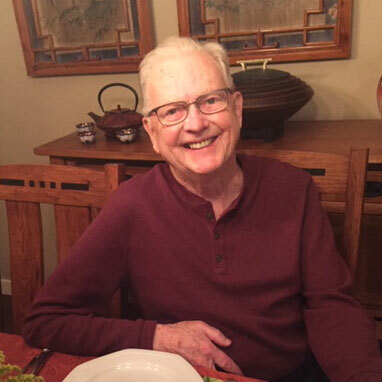 Dan was a gregarious, thoughtful, and kind man whose legacy of love will continually reside in the hearts and minds of his loving wife, family, and devoted friends. Dan was preceded in death by his parents, Robert and Agnes Jordan. Dan is survived by his wife, Marcy Kuhlman; daughters Pamela Harshberger of Happy Valley and Janice Jordan of Vancouver, Washington; brothers Robert Jordan and wife Carole of Marshfield, Mass., Henry Jordan and wife Rita of Boston, Mass., Bill Jordan and partner Rosemary of Dorchester, Mass., Jim Jordan and wife Catherine of Happy Valley; Sister Linda Pritts and husband Richard of Mt. Pleasant, Penn. He is also survived by many nieces and nephews. Memorial contributions may be made to: Partners In Care, 2017 NE Wyatt Ct., Bend, OR, 97701. A celebration of life for Dan is planned for spring 2019. Dan was a wonderful man and we were lucky to be friends with him for many years. We have lots of memories of great times together with he and Marcy, to treasure always. He will be missed by all who knew him. This comment has been hidden due to low approval.